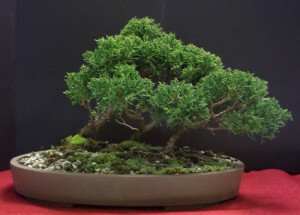 All our Bonsai are professional grown, shaped and artistically crafted by Bonsai Artist, Timothy Weckman. Shipping is calculated based on shipping address zip code. Cannot ship to California or outside the continental United States. Shimpaku Sambon-yose group. Trees are 10″ tall above the 14″ unglazed oval container.